Lossiemouth House was built in 1779, during the reign of King George III. 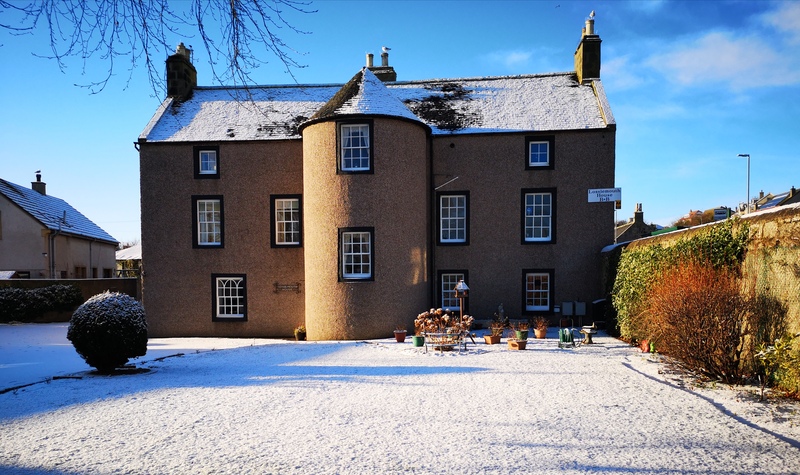 It was the first substantial house built in the town of Lossiemouth and was constructed as a dower house for Lady Agnes Gordon of Gordonstoun (whose estates now form the confines of Gordonstoun School). The photograph below shows Lossiemouth House (the 2nd on the left) and the extent of its original gardens. Lossiemouth is the birthplace of James Ramsay MacDonald, who became the first Labour Prime Minister in 1924. The house that Ramsay MacDonald was born in is round the corner from Lossiemouth House. Currently, there is a Royal Air Force base located just to the south-west of the town. This was originally a flying training school and then the Royal Navy Air Station, HMS Fulmar, before it was handed over to the RAF in 1972. There are six squadrons based at RAF Lossiemouth, including the Typhoon FGR4 jets and soon to be P-8A Poseidon maritime patrol aircraft from 2020.